VIAS cordially invites you to participate in a half day Advanced Biomedical Simulation Seminar at the Texas Medical Center in Houston. Failure of pharmaceutical packaging incurs the risk of negative health outcomes and expensive product recalls. Pre-filled syringes represent a growing portion of the drug packaging market. During its working life, a syringe ex-periences stresses that may result in material damage. Specifically, the syringe barrel may develop microcracks that coalesce and propagate, causing the syringe to frac-ture and its contents to lose sterility. Abaqus/Standard offers the technologies necessary to include fracture and failure in the syringe design process. In the design of hearing instruments it is important to achieve the highest possible gain without introducing feedback between the microphone and loudspeaker. With more gain, a larger hearing loss can be accommodated and a greater number of users benefit. Maximizing gain while minimizing the possibility of feed-back requires an optimal choice of design parameters. In this Technology Brief, we outline how Abaqus/Standard and Isight can be combined in a process to optimize the vibro-acoustic characteristics of hearing instruments. Biodegradable polymeric stents must provide mechanical support of the stenotic artery wall for up to several months while being subjected to cyclic loading that af-fects the degradation process. To understand the appli-cability and efficacy of biodegradable polymers, a hypere-lastic constitutive model is developed for materials under-going deformation-induced degradation. The model was implemented in Abaqus/Standard and applied to a com-monly used biodegradable polymer system, poly (L-lactic acid) (PLLA). In the adaptive bone remodeling process, the density of bone tissue changes over time according to the load it sustains. Elevated loads produce increases in bone den-sity while reduced loads cause reduction of bone density. 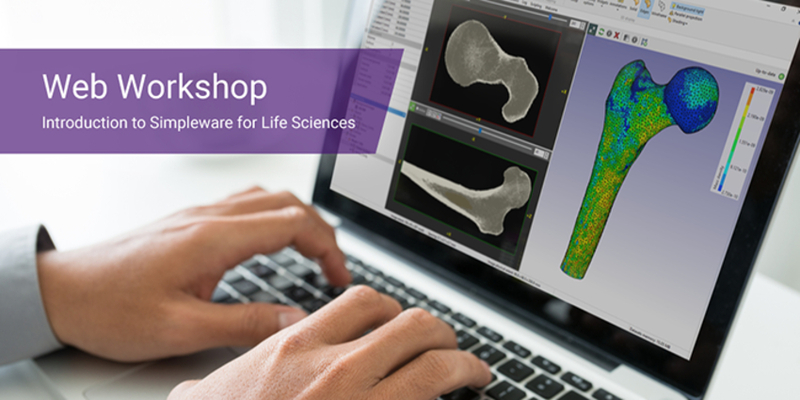 The long term success of an orthopedic implant can be better predicted by including this process in the design workflow. In this Technology Brief, we demonstrate the Abaqus/Standard implementation of one of the leading bone re-modeling algorithms. Electroencephalography (EEG) is used to obtain informa-tion about the electrical activity in the brain and is rou-tinely used to diagnose neurological abnormalities. The inverse problem in EEG refers to the procedure of locat-ing electrical sources in the brain from the extracranial electrical field measured on the scalp. The solution of the inverse problem requires the forward calculation of the electric field for a given source location. The ability of a finite element simulation to accurately capture the behavior of a structure strongly depends on the chosen material model. Not only must it be applica-ble to the given class of materials and intended applica-tion, it must be properly calibrated. Sophisticated material models that use many parameters can present a challenging calibration task. Optimization techniques can be employed to determine suitable pa-rameter values. The superelastic, shape memory, biocompatibility, and fatigue properties of Nitinol, a nickel-titanium alloy, have made the material attractive for medical devices such as cardiovascular stents. However, it is a complex material and difficult to process. Finite element modeling of Nitinol devices such as stents reduces testing and time-to-market by allowing the designer to simulate the stent manufacturing and deployment processes. The constitu-tive models for superelastic alloys are available as user subroutine libraries for both Abaqus/Standard and Abaqus/Explicit. Trabecular bone must withstand the loads that arise during daily activities as well as those due to trauma. Investigation of the mechanical properties of trabecular bone presents a challenge due to its high porosity and complex architecture, both of which vary substantially between anatomic sites and across individuals. While Micro Finite Element (μFE) analysis of trabecular bone is the most commonly used method to analyze trabecular bone mechanical behavior, the large size of these models has forced researchers to use custom codes and linear analysis. The modelling of welds is desirable to predict the distortion of components during manufacture, the position and magnitude of peak residual stresses and to predict metallurgical effects in specific regions. Welds are a complex modelling problem requiring both thermal and structural solutions. This has lead to the development of several weld-specific simulation packages and codes for finite element analysis packages. This paper describes the application of the newly developed Abaqus 2D Weld Modeller to simulate the residual stress field in ferritic weld test specimens. Electric Boat’s design process involves evaluating the structural stability of ring-stiffened cylinder structures through finite element analyses to simulate a static pressure load. Each design revision of the cylinders must be evaluated to verify that the structure meets the required stress criteria for the static pressure load; any revision to geometry or material would require the design to be reevaluated. Additionally, it is critical that the weight of the structure is kept as light as possible while still satisfying all stress and deflection criteria. Biomechanics testing of the lumbar spine, using cadaveric specimens, has the advantage of using actual tissue, but has several disadvantages including variability between specimens and difficultly acquiring measures such as disc pressure, bone strain, and facet joint contact pressure. A simulation model addresses all of these disadvantages. The objective of this work is to develop a method to simulate the biomechanics of the lumbar spine. A process is currently being used to convert a CT scan of a lumbar spine into a simulation model. 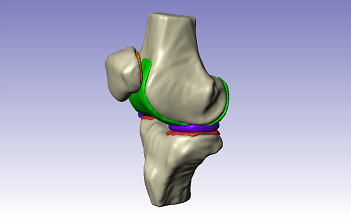 Total knee replacement gives proven good results for isolated patello-femoral osteoarthritis, but patello-femoral arthroplasty may be more appropriate because only the joint compartment is replaced. Although the femoral component of a patello-femoral prosthesis is smaller than in total knee arthroplasty, it is unknown whether strain-adaptive periprosthetic bone remodeling occurs following patello-femoral arthroplasty. The aim of the study was to evaluate and compare the stress shielding effect of prosthetic replacement with Finite Element (FE) modeling. Genetic algorithms have become one of successful tools in design and topology optimization. The optimization module based on genetic algorithms was developed and employed in Abaqus/CAE by GUI and kernel scripting. The new module extends advanced functionality of Abaqus/CAE allowing to perform optimization directly in Abaqus Unified FEA product suite from SIMULIA. The genetic algorithms implemented in optimization approach are based on available GPL libraries. In this study we compare various way of quantifying high cycle radial fatigue behavior in a percutaneous Mitral repair device using Goodman methods. In order to provide an improved representation of the tissue-device interaction, we use an Ogden hyperelastic model to simulate the native vessel with parameters obtained from pressure-diameter test data of human cadaver heart coronary tissue, and published data presented in previous work. Computational modeling of stents can provide insight into critical locations (high stress/strain regions), help with design iterations/optimization, and reduce the need for bench-top testing. This study focuses on the developmental efforts to create a material model that can capture the mechanical response of poly-L-lactide (PLLA), the backbone of Abbott Vascular’s ABSORB Bioresorbable Vascular Scaffold (BVS). PLLA is an anisotropic, viscoplastic material. Endovascular aneurysm repair involves insertion of an introductory component called guidewire through native vessels to help with the guidance of the delivery catheter. Guidewire tends to alter the vessel geometry due to its higher stiffness compared to the vessel wall. Very limited data is available to understand such interactions. Investigation of interaction between guidewire and native vessels could provide useful insight into vessel stresses and guidewire deformation in-vivo. To enhance the fatigue life of metal components, frequently compressive stress is introduced to the surface layer. Although procedures such as shot peening have been practiced for many decades in other industries, an improved understanding of the fundamental mechanics that leads to the improved performance is desired. From a continuum mechanical point of view, the interaction between the crack and the stress intensity field is the factor determining whether the crack will propagate. The stresses in a battery housing used in Implantable Pulse Generators (IPGs), also known as pacemakers, were investigated using Abaqus/Standard. There were three levels of analysis: the global level, the three-dimensional submodel level and the plane strain submodel level. The output of the global analysis was fed into the three-dimensional submodel analysis and subsequently the output of the three-dimensional submodel analysis was fed into the plane strain submodel analysis.